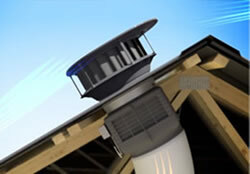 Odyssey is a smart, energy efficient, free air cooling system for your home. It also provides thorough ventilation of the home to remove odours, allergens and freshen the air. Designed and built in Australia to meet the demands of the harsh Australian climate, Odyssey can lower your cooling costs by taking timely advantage of the natural temperature differences. 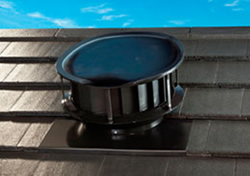 Incorporating award winning and highly efficient hybrid technology, the sleek roof mounted ventilator is ducted through your roof space to an attractive ceiling vent in the living area. Internal and external sensors monitor internal and external temperatures and work out how best to maintain comfortable living environment within your home. With the touch pad control system, you can set your preferred temperature or choose the BOOST feature to give your home a breath of fresh air. One Odyssey unit is suitable for homes with living space up to 150m² with two units recommended for homes with living spaces between 150m² - 300m². During the day, when external temperatures are higher than inside home, the Odyssey works in roof cool mode to exhaust the hot air from your roof space. When the outside temperature falls below that of the inside, the Odyssey automatically switches to indoor cool mode to efficiently remove the heat from your space. 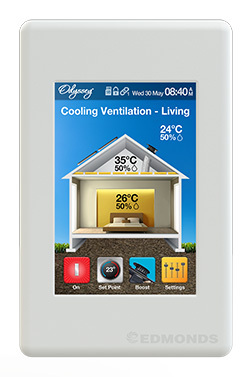 Odyssey continues to work throughout the night to cool down the walls and floors of your home which would otherwise continue to radiate the stored heat.